We all need to change our passwords every once in a while – for security reasons or just because we've forgotten our old one. It's a good idea to change your passwords from time to time; not just on Trustpilot, but in general. It's easy to change your password, and to reset it if you've forgotten what it was. Point to your name in the upper right-hand corner of the screen, and select My Settings from the drop-down menu. 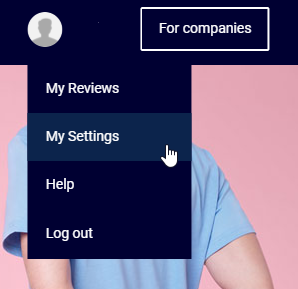 On the Trustpilot homepage, select Log in in the upper-right hand corner of the screen. Select the Log in with email button, then select the Forgot your password? link. Enter the email address that you used to register with Trustpilot, then select the Reset password button. Check your Inbox for an email inviting you to choose your new password. If you don't receive it within a few minutes, be sure to check your Junk/Spam folder. If you are still experiencing issues logging into your account please contact our Support Team either through our contact form or through our live chat here on the Support Center. Having problems logging in to Trustpilot Business?